The countries adjacent to the Mediterranean Sea and the Indian Ocean produce a profusion of forms noted alike for their beauty and economic value. In this region, with about forty-five sister species, is found the plant of our illustration. Carried from its home, it is now a common decoration of the greenhouse and private conservatory. Its sisters are of economic value. Some are used for garden hedges, some to arrest the ever-drifting sands of the seashore, and some to furnish a tanning principle. These plants belong to the pea or pulse family, which also includes the clovers, the peanut, the locusts, the vetches, the acacias, the bean, the lupine, the tamarind, logwood, and licorice. It has been estimated that this family contains over four hundred and sixty genera and about seven thousand species. Here are grouped herbs, shrubs, vines, and trees, the fruit of which is a pod similar in structure to that of the bean, and usually with irregular flowers. In this family the beasts of the field, as well as man, find some of their most valuable foods, and nearly all the species are without harmful qualities. The pure yellow flowers are grouped along the branches in terminal clusters. They are sweet-scented, showy, and frequently so numerous as to make the plant appear like a mass of yellow blooms. The leaves are very small, consisting of three leaflets similar in form to those of the common clove. The surface of the leaves and of the young twigs is covered by fine and soft hairs, causing a hoary appearance. 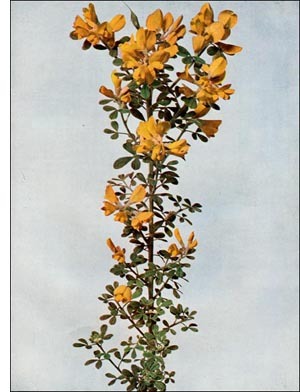 The plant is a shrub varying in height from a few inches to that of a man. It bears numerous and crowded branches.